The example system for daytrading by author James Breen is simple enough to avoid coding in Wealth-Lab entirely. You can compose it from building blocks known as Rules simply in a drag and drop manner. On Figure 1 we provide an example of setting it all up. Note that the condition "Price crosses X% above/below an indicator" is universal i.e. can be used with different kind of indicators such as moving averages, filters, price bands and channels. 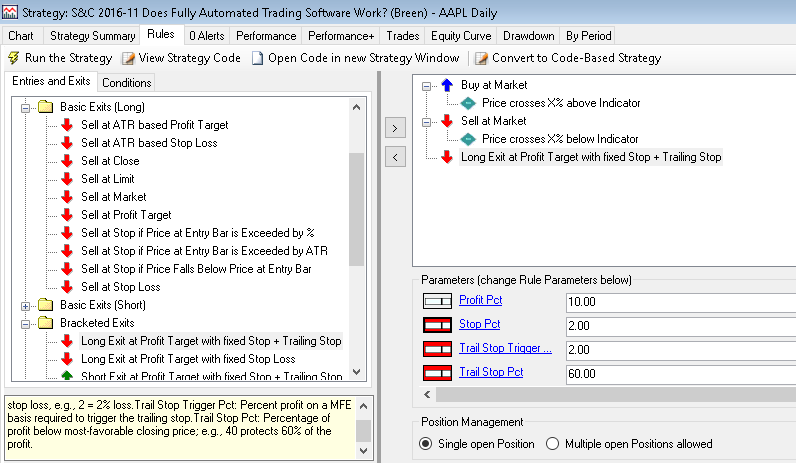 In addition to author's rules, a profit target exit is installed to capitalize on big intraday moves. The red icon indicates that the parameter next to it is exposed as "Parameter Slider", enabling to change its value by dragging the slider on the bottom left part of the screen. When you run the system on the chart of a single stock (as opposed to a multi-symbol portfolio), Wealth-Lab automatically and conveniently applies changed parameters so you have a chance to see how entries and exits change interactively on the chart.